WTSP Meteorologist Ashley Batey says Hurricane Michael is packing major hurricane strength, a lot of rain and significant storm surge threats. Rick Johnson fills sand bags on Oct. 9, 2018 at his Okaloosa Island home in Fort Walton Beach, Florida, in preparation for Hurricane Michael. Hurricane Michael gained strength Tuesday on its march toward Florida’s Gulf Coast, gaining Category 2 status and poised to roar through the state with historic devastation. The National Hurricane Center warned that the quick-moving storm could make landfall Wednesday afternoon near Panama City, 100 miles west of Tallahassee, as a Category 3 storm with torrential rains and sustained winds of up to 120 mph. Gov. Rick Scott said the state could begin feeling Michael’s impact late Tuesday. As of 11 a.m. EDT, Michael was moving north at 12 mph, about 335 miles south of Apalachicola, Florida, with maximum sustained winds of 110 mph. The wind speed was just one mph short of Category 3 status. Scott declared a state of emergency for 35 counties and said he was seeking a federal disaster declaration from President Donald Trump, who promised full support for Florida’s efforts. Scott activated 2,500 National Guard troops and made more than 300 state troopers available for deployment. Evacuations have been ordered in parts of 10 counties. More than 100,000 people were ordered out of a long swath of low-lying communities, including many in Bay County, home of Panama City. The Florida Panhandle, southeast Alabama and southern Georgia will see 4 to 8 inches, with isolated areas facing 12 inches, Scott said. Storm surge could reach a monstrous 12 feet in some areas – enough to “easily go over the roofs of some houses,” he said. Alabama Gov. Kay Ivey issued a state of emergency in anticipation of widespread power outages, wind damage and debris produced by high winds. In Georgia, Gov. Nathan Deal declared a preemptive state of emergency for 92 counties. “I ask all Georgians to join me in praying for the safety of our people and all those in the path of Hurricane Michael,” Deal said. 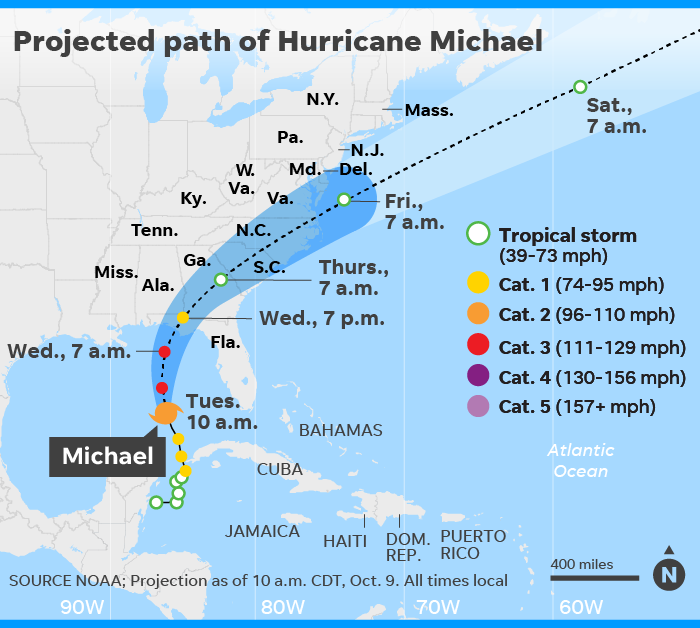 FEMA administrator Brock Long said the agency was prepared for the storm in all the states likely to feel Michael’s impact. The hurricane center, citing Michael’s dangerous trifecta of storm surge, flash flooding and winds, described the seventh hurricane of the Atlantic season as “life-threatening.” The National Weather Service in Tallahassee called Michael “a potentially catastrophic storm” for the capital city. AccuWeather predicted the storm’s economic impact damage will approach $15 billion. That’s actually an encouraging total compared to the weather agency’s $60 billion damage estimate from Florence, which blasted the Carolinas and parts of other states a month ago. AccuWeather chief Joel Myers said Michael is forecast to role through the region much more quickly than did the lingering Florence, which dumped up to 40 inches of rain in some areas. “We expect less rain to fall when compared to Florence,” said AccuWeather senior meteorologist Dan Kottlowski.